Over the last few weeks I’ve been re-reading some old diaries of mine, because I’m going to take part in a radio programme called ‘My Teenage Diary’. Went back to school today. Had 12 big sums. Had to write about happiest moment during hols and things like that. We had drama today. Went home to dinner. Science today. I had to build a starship. Today we bought a dishwasher and a new rug. It seems a dreadfull [sic] waste of money. Went swimming after school today. T had a lesson. I swam 30 lengths breast stroke. At school a new boy, called Richard Roy. He’s nasty I think. Had Miss World today. I was second in Miss World competition. Sore throat. Went on two long walks alone. Thought it would be nasty at school. It wasn’t. HP for history. Piano. Library Book. Went to library. Bought battery for wish machine. Worked a lot on it. I’ve made blue water go plotiter plotiter. Went to Rachel Lee’s party in the afternoon as a tramp. Buyed a lovely orange rabbit. This a reference to a book by Diana Wynne Jones in which the character make something called ‘A Watery Wish Machine’ or similar. It involved blue water that had to run through a tube and make a certain sound. I’m very sorry to have discovered, just now this minute, that Diana Wynne Jones died in 2011. I used to love her books. I can’t see AD in that box of diaries. All I can see is Lucy W on one of them. I think it’s brought not bought a lump to my throat. You can’t misspell writing to the great Lucy Worsley. I love this blog post. It has made me think back to all the diaries I religiously wrote in every night. I was so determined to hide them from my mother and sister that I hid them under my mattress right in the middle. They’re still up in the attic at my mother’s house, so chances are she has read them now. The thought of going through them is so cringe worthy that I may continue to avoid them for many more years! “Second in Miss World Competition” definitely needs to go on your C.V.
Little girls are all the same…at least the bookish ones. I was obsessed with the same topics in everyday life but even more obsessed with books and the secrets THEY reveal about real life (even LOTR). What a treasure your old diaries are! Not only the entries, but also the books itself with their designs etc. Did you also scribble in them? Yay – another DWJ fan. Actually, two of your books are currently piled with a few of hers around me at the moment – re-reading them as a grown up has reminded me how fab she is – & I have been able to collect more that were available in the pre-interweb age. You sounded like a very spiffy child. Lucy, I find you fascinating (although not in a stalkerish way!) and love your TV programs. Yes she great isn’t she. And she’s a credit to Englands history enthusiasts. Shame that your great country hasn’t got many years of historical grandness like ours eh! Would you like a US monarchy like ours..
” Science today. I had to build a starship” ………Wow, all I got to build at school was a tape cassette holder; and all I ever built in science was an immunity to that laboratory smell. Good school, perhaps you went to the same one as Richard Branson?! Makes me regret binning my teen diaries – however, if I remember rightly, I was such a maudlin teen that it would probably read as over dramatic and quite scary. I held grudges big time! I love this programme on R4, will listen out for it. I love diaries and journals! Just the sight of that box, knowing that it’s filled with a multitude of secrets and memories….all laboriously written out by hand… get’s me all giddy! I burned all my old diaries when i was 19 because I was living in a shared apartment and couldn’t bear the thought of anyone digging them out and reading them. I’m not entirely sure if I’d still want to read them myself now, but a part of me IS curious as to just how annoying (and probably grandiloquent!) the younger me actually sounded. I keep a journal myself today, but it’s really nothing that would be of any interest to anyone else. When you grow up, find the guy of your dreams and start to live your mostly happy ever after, you’re much less likely to be found writing 5 or 6 pages lamenting the fact that ‘so-and-so who smells of Cool Water’ doesn’t even know you exist! 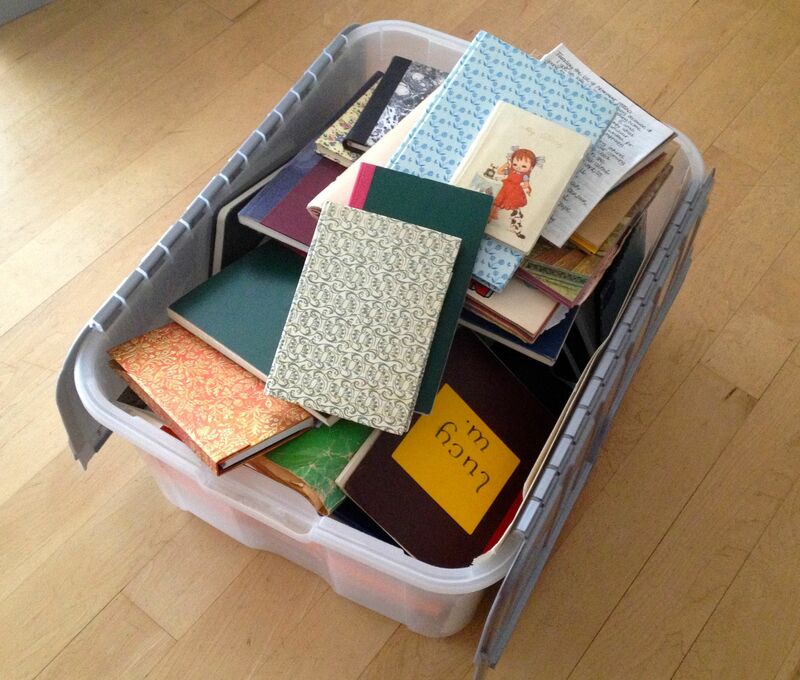 I keep them now, more as just a historical record of my life and a braindump for a lot of my ramblings and rantings. I (and the teenage me, still buried deep inside) will look forward to listening to your appearance on this Radio 4 programme, in the near future.